Sasha dolls were created by Swiss Artist Sasha Morgenthaler, who was born in 1893. The dolls found fame in the 1960’s when they were commercially produced for the first time by Trendon Toys of Stockport, England. From the beginning the dolls attracted attention, being the design of an artist they were different to any other play dolls around at the time. They were also more expensive and have always been seen as more exclusive. 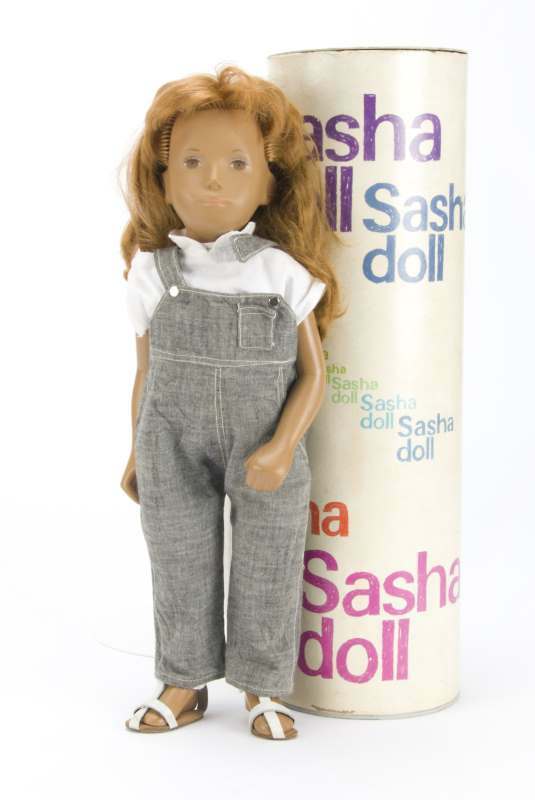 Before the commercial production of the dolls Sasha Morgenthaler produced one-of-a-kind 20″ vinyl, gypsum, and cloth dolls. 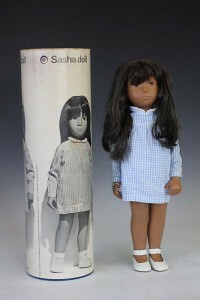 She used these dolls to develop the design for the 16″ production play-dolls, that became popular in the 1960s. The early one-of-a-kind studio dolls were expensive to produce and expensive to buy. The dolls were beautifully designed with their body parts realisticaly proportioned, almost exactly one quarter-scale, and asymmetrical. Their balanced bodies enabled them to stand on their own without the use of stands. Sasha dolls reflected the designers vision of creating dolls that would reflect the spirit of children of all races and nationalities during their age of innocence. The dolls all have pensive expressions. 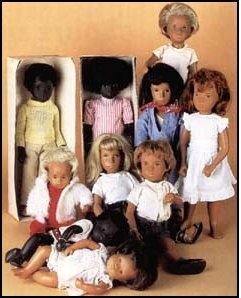 A number of different types were eventually produced including Sasha herself, her brother Gregor, Cora and Caleb (black boy and girl dolls) and a baby (the babies were 12 inches long) which also came in black or white skin tone. 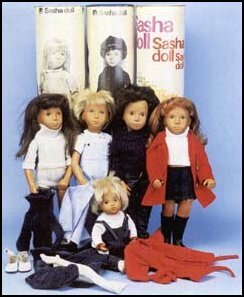 Trendon ceased production of Sasha Dolls in 1986 and they were not produced again until 1995 when Götz-Puppenfabrik GmbH of Rödental, Germany began to make them again. 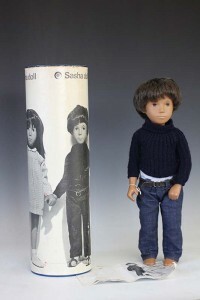 The company had also produced the dolls briefly from 1964-1970. 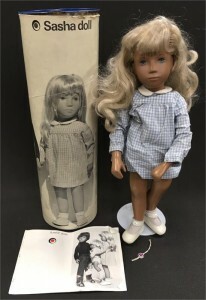 Outfits for the Sasha dolls were also sold separately and other accessories were also manufactured including a wicker basket and padded nest for the babies, and also design patterns for various outfits. Trendon also produced a few Limited Edition Sashas from 1981-1985.
blue and white gingham dress. Sold for £140 at Trevanion & Dean, Sep 2016. Sold for £110 at Trevanion & Dean, Sep 2016.
grey dungarees, white short sleeve shirt. Sold for £520 at SAS, June 2018. Sold for £190 at Cottees Auctions, April 2018. Today the dolls are very collectable. The current range produced can still be found in the shops, but the older dolls are much more difficult to find. There is strong demand for good condition dolls especially in the US, but there is also considerable interest in the UK and Europe. NOTICE – This site is not affiliated or associated in any way with Götz-Puppenfabrik TM or Sasha Dolls. 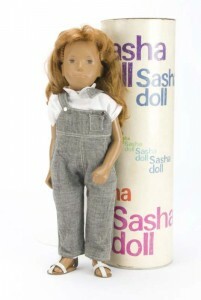 The purpose of these pages is to provide information to collectors of Sasha Dolls.